The Kiev regime is utilising western provocations against Russia over the crash of flight MH17 as the cover for a major military offensive in eastern Ukraine. Reports speak of a developing humanitarian crisis, with 230,000 people internally displaced due to the conflict. The onslaught comes after Ukraine’s Rada agreed on Thursday to impose an additional 1.5 percent hike in income tax to fund military operations. The across the board tax, which will hit an already impoverished population especially hard, came just a week after the Rada agreed to further expand conscription, following the reinstatement of the military draft in May. These actions are indicative of the authoritarian character of the regime installed with western backing in February. The tax was approved despite the fact that just the week before, Prime Minister Arseniy Yatsenyuk had announced his resignation and that of the entire cabinet, bringing down the government. The billionaire oligarch and President, Petro Poroshenko, in league with extreme-rightists, is using the ensuing instability to press Kiev’s advantage. The objective is not only to suppress pro-Russian separatists, but to intimidate the entire Ukrainian population in advance of new elections, scheduled for October, which they hope will rubber stamp the austerity demands of the European Union and International Monetary Fund. Government forces, including fascist brigands, have reportedly taken control of the towns of Krasnogorovka and Staromikhailovka, just outside Donetsk—the centre of pro-Russian separatist forces. These towns are close to the area where MH17 crashed on July 17, killing all 293 passengers and crew. Without a shred of evidence, the western powers, led by the US, have blamed Russia for the aircraft’s downing and have imposed sweeping sanctions against Moscow. Yet, more than a fortnight since the tragedy, the results from the official investigation into the crash have still not been released. Talks in Belarus between Ukraine, Russia and the Organisation for Security and Cooperation in Europe (OSCE) last week agreed a local cease-fire in the vicinity of the crash site to enable the recovery of bodies. But even as the team of some 400 investigators began their task, the Ukrainian regime took advantage of the agreement to encircle Donetsk and cut its link with Luhansk, the other main pro-separatist stronghold. Significant fighting has been reported around Shakhtarsk, just 15 miles from the main crash site. At least ten Ukrainian troops are said to have been killed in their attempt to retake the town, which links Donetsk and Luhansk, from rebel forces on Friday. Pro-government forces are bombarding Donetsk, home to 1 million people, particularly the outlying suburbs. On Wednesday, 19 people were reported to have been killed in just 24 hours as Ukrainian forces fired heavy artillery shells into a number of apartment blocks in the Vetka district, just one mile from the city centre. Train departures were suspended after rail lines were damaged. Luhansk, near the Russian border, is said to be completely surrounded by government forces and without electricity and running water. The city, usually home to 400,000 people, has been shelled for more than eight days. While there are no figures available as to the causalities of this latest onslaught, the United Nations estimates that more than 1,100 were killed in the six weeks leading up to July 26 and 3,500 wounded. Almost 40,000 people have taken refuge in camps in Russia’s Rostov region. The Russian Red Cross described the situation in eastern Ukraine as a humanitarian catastrophe and has urged the evacuation of all children from the war zones. “Believe me they are fleeing. We are getting calls saying ‘let us leave the towns’,” he gloated. Following his appointment by Poroshenko on July 3, Geletey reportedly boasted that “Ukraine will win” the civil war and that its “victory parade is sure to be in Ukrainian Sevastopol.” On March 16, Sevastopol, as part of the Crimea, voted in a referendum to become part of the Russian Federation. After scenes in mid-April when a regular battalion of the Ukrainian army refused to fire on a crowd near Slavyansk and abandoned their arms, the Kiev regime has established a national guard and is relying on “volunteer” militias—many comprising open fascists—to prosecute its war in eastern Ukraine. 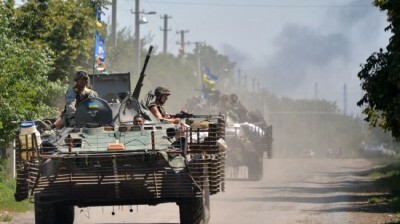 Such brigades have been “instrumental” in the Kiev offensive, it noted approvingly. Such is the racist filth on which Kiev and its backers in Washington and Brussels are relying in their geo-strategic offensive against Moscow. Biden’s son, Hunter Biden, it should be noted, has been named director of Burisma Holdings, Ukraine’s largest private natural gas production company. Washington has also pledged $8 million in new aid to bolster the Ukrainian border guard service. For its part, the European Union has sent “security advisers” to Kiev to help restore “law and order” in rebel areas. An initial £2 million has been allocated to fund the advisers, which are said to be unarmed. The EU has also lifted its ban on supplying Ukraine with military technology and equipment. It was imposed earlier this year in support of the pro-western Maidan protests. In a statement, Russia accused the EU of double standards. While the recent meeting of the Council of Europe in Brussels had overturned the ban to Ukraine “on the quiet,” it said, the same meeting had agreed sweeping sanctions against the Russian defence sector.